Rod Sloane has delivered the most popular marketing webinars on the BrightTalk platform in 2016. Rod receives lots of questions. 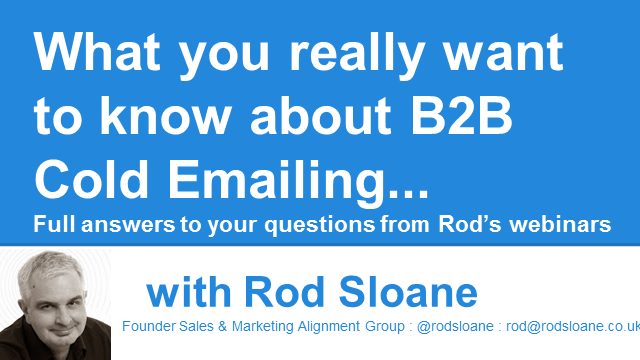 This bonus webinar allows Rod to answer your questions about B2B cold emailing in detail. Book Now! Join me on August 16th live or catch up later on-demand. Rod Sloane shares the best practices to leverage your profile and content to achieve success in 2018 on Linkedin. This webinar will show you how to write emails that start more conversations that lead to sales opportunities. Presenter, Rod Sloane, will expalin how you can write in the language of your prospect. This webinar will expalin how you can boost your sales pipeline immediately.. Ideal for salespeople, management and executive teams. Our speaker will share the five tactics to adopt to dramatically grow your sales pipeline. Rod Sloane talks about growing a start up or small business with outbound techniques. Working with Aaron Ross, author of Predictable Revenue, Rod uses a proven, developed system to drive opportunities into your sales pipeline. Rod will share what stops companies from achieving predictable revenue and what actions you need to undertake to ensure that you start to grow your sales pipeline on-demand. Rod Sloane, Predictable University UK Country Manager, shares the reasons people register for this top business development programme. If your organization’s success is driven by B2B sales, you need to be an expert prospector to successfully target, qualify, and close business opportunities. Marylou Tyler provides the immediately implementable strategies you need to build a solid, sustainable pipeline — whether you’re a sales or marketing executive, team leader, or sales representative. • Craft personalized e-mail and phone messaging to address each potential buyer’s awareness, needs, and challenges. You’ll learn how to target and track ideal prospects, optimize contact acquisition, continually improve performance, and achieve your revenue goals—quickly, efficiently, and predictably. The book includes easy-to-use charts and e-mail templates, and features full online access to sample materials, worksheets, and blueprints to add to your prospecting tool kit. Following this proven step-by-step framework, you can turn any B2B organization into a high-performance business development engine, diversify marketing lead generation channels, justify marketing ROI, sell into disruptive markets—and generate more revenue than ever. That’s the power of Predictable Prospecting. Business Ideas from the worlds greatest innovators Rod interviews Paul Sloane. We will discuss insights and lessons from artists, inventors and business leaders and review how you can apply them to your challenges. There will be opportunities for you to do some lateral thinking and to learn new methods to generate great ideas. We′ve all been in that situation where we′re asked a tough question by the boss, interviewer or client – and end up saying something really stupid, wrong or self–defeating. When caught in these challenging situations, how do you work out what to say and how best to say it? Learn how to prepare, write and send emails that makes it easy for your target prospects to respond. Find out what mistakes companies often make in their business development emails and discover easy ways to avoid them. Enjoy greater responsiveness and participation by your prospects, leading to easier sales communications and higher conversion percentages. This session is appropriate for CEOs, Managing Directors, VP Sales, VP Marketing, Sales Managers and Sales Reps. It is valuable for those currently using emails in their business development and for those just getting started with emailing as a new tactic. A live question and answer session will let you guide the session to concentrate on topics of the most interest and benefit to you. What you need to consider if you are tackling Sales and Marketing Alignment.